I am beyond excited to share with you my first tutorial today, one of what I hope will be many more to come. 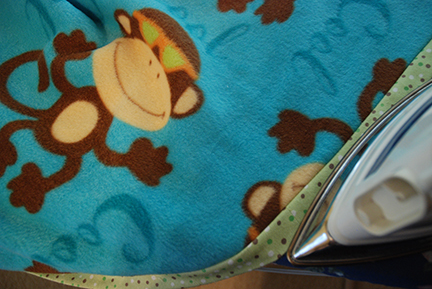 This is for a cuddly, reversible fleece blanket. I started making these a few years ago, and have yet to make one for anyone who didn’t wind up loving it. They’re warm, they’re soft, they’re machine-washable, and you can make one in less than an afternoon. I love picking out the combinations of fleece and often use the flannel (which will make the binding) as a way to give a pop of color, as you can see with the combo deal on the right. 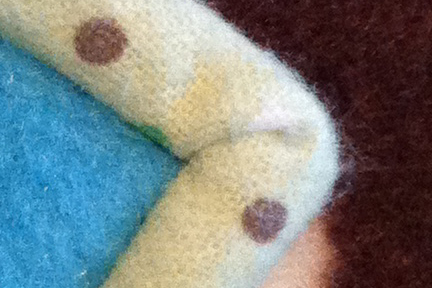 There isn’t green on the blue monkey or brown dot fabric, but there are brown and white dots on it, and who doesn’t love blue and green together? If you’d like to put a label of some kind on one of the sides, do so before you put it on your flat surface for pinning. Don’t be like me and forget to do this (every time!) Be sure it’s not too close to any of the edges or where you need to trim so you don’t accidentally cut it off. 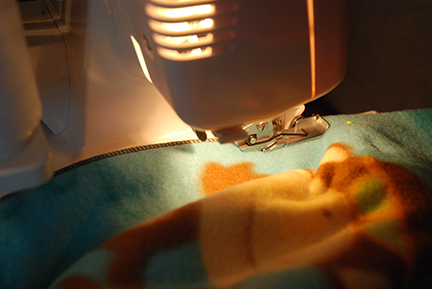 Next, place your fleece fabrics on a flat surface, wrong sides together, smoothing the fabric as much as possible, until you’re satisfied there are no lumps anywhere. I like to use my bed, because I can pin the two layers without killing my back or knees like I would using the floor. You just need to be careful and not pin the fabric to the comforter. 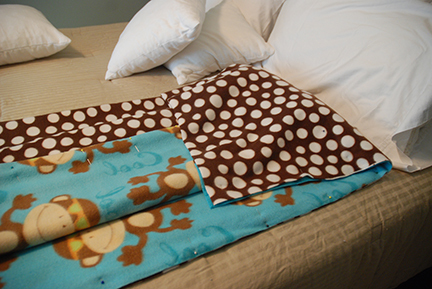 Tip: if you make this during winter and use microfiber fleece sheets, they will help keep the bottom piece stable, since the two fabrics will stick together. Also, sometimes it’s difficult to tell which is the right and wrong side. A good place to look is the selvage. You can often see the darker (or right side) ink there. When you pin the fabrics, you want to pin about every six inches, and pin about an inch from the selvage. Working with such big pieces of fabric, there’s a tendency for them to shift, so having lots of pins now will help you later. They’ll also serve as a cutting guide. Also, be sure to check how wide the selvage is on both sides before you pin, so that you’ll be sure to cut it all off. The last thing you want to do is trim and overcast, only to have to redo it. 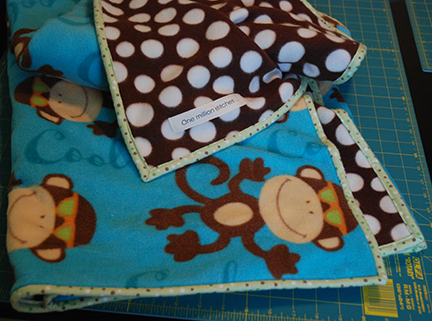 For example, the selvage on the other side of this monkey fabric was two-inches wide. Trim off the curled selvage using your pins as a guide to keep your cut line straight. If you do this on your bed like I did, obviously be careful not to cut your comforter. You could always wait to do this until laundry day when your bed is stripped. Sometimes, in fact, more often than not, your two pieces of fleece won’t be the same size. When that happens, put the larger piece on the bottom so you can see the top and don’t accidentally cut it more than you need. Also, be sure you scream loudly when you go to put your pillows back on the bed and find a large spider crawling all over them. Next, you’ll serge all four sides together. 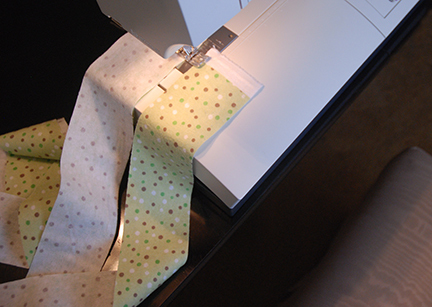 If you don’t have a serger, you could stitch a straight seam with your sewing machine about an eighth-inch from the edge. The edges are not going to fray, so the serging and stay-stitching just help keep things together when you put the binding on. One of the advantages of the serger, is that the blade will clean finish your edge for you. You don’t need to remove much, only whatever jagged parts your edge might have. This is partly why you pin/trim the fabric first. I’ve made this without trimming, and my serger really didn’t like dealing with the curled bulk on the selvage. I later found it was easier to keep the lines straighter and neater overall, too. When you get to a corner, just serge a little beyond the edge, enough to give the threads enough slack to turn the blanket and start the next side before the blade. 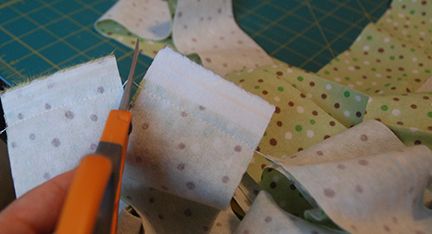 Since the serging will be covered, you don’t have to worry about the excess stitches, you’ll trim them off later. After all four sides are done, it’s time to make the binding, exactly the way you would for a quilt. Start by pressing your flannel and trimming off any excess with a rotary cutter on one edge to ensure a straight line. Then, cut your flannel into 2.5-inch strips. You should have seven strips total, which will be enough for the blanket, possibly more. 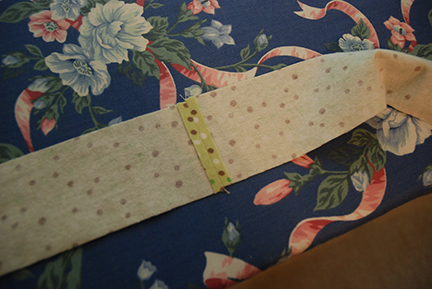 Next, sew the strip right sides together, making sure you’re past the selvage on both sides. You can sew these in a continuous chain, leaving enough room between the sections to clip. 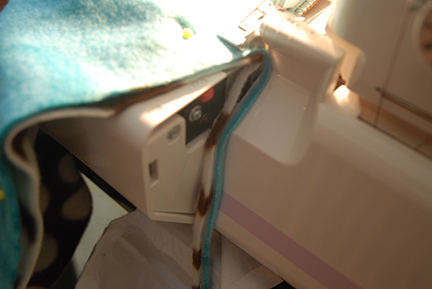 I take the end of the strip I’ve just sewed and put another strip on top, right on the machine (as in the photo above). 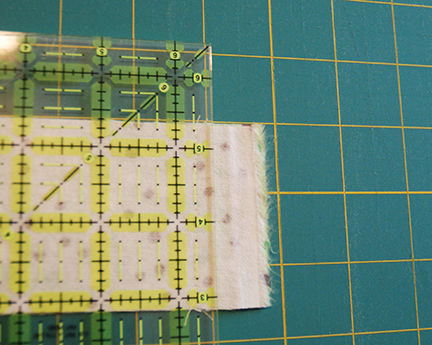 Once you’ve clipped the sections, trim the edges to 1/4-inch away from your stitch line with the rotary cutter. 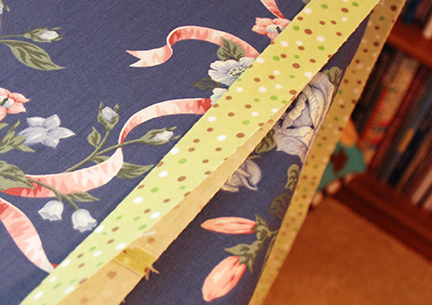 Note: I chose to do straight seams on the binding here. If you prefer, you can sew the pieces together on the diagonal (putting them right angles first) and then trim to create bias binding. I’ve done it both ways and don’t find the the bias necessary since you’re not going around a curve at all. Next, press your seams open. Then fold your strips in half lengthwise and press. 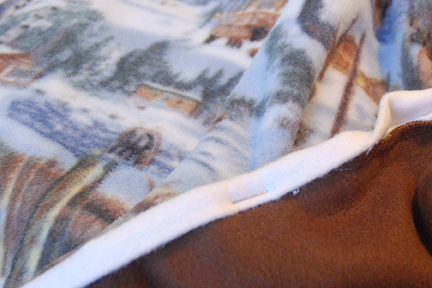 Trim the excess stitching on the corners of the blanket. 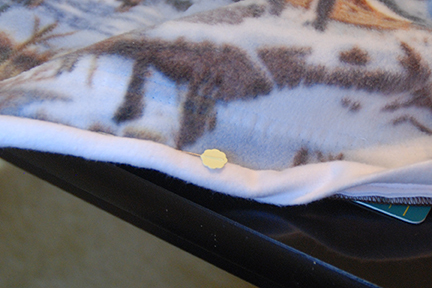 Attach the binding to the blanket with the raw edges facing outward and leaving a 10-inch tail. You’ll only pin the first side until you reach the corner. 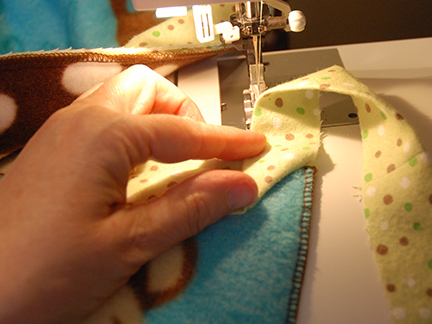 To begin, place your binding near the corner, but not too close; stitching at least five inches away is good. I find this helps prevent having to deal with one of the seams landing at the corner, which on these would be way too much bulk. Pin until you reach 1/4-inch from the edge of that side. Tip: If you’ve forgotten to put whatever label you want to use on the back (like I do) and have serged all the edges together, instead of taking one side apart, you can attach your label in this first seam. I have tape labels, so I fold them in half and pin them with the cut side to the edge, leaving enough room when I fold the binding over so my name still shows. Backstitch a few stitches at the beginning and then sew a 1/4 inch seam. When you’re 1/4-inch from the corner, backstitch a few stitches, lift your presser foot and turn the work. Next, take the binding and fold it to make 45-degree angle at the corner. Make sure the edge of the binding will line up with the edge of the next side. Sew a few backstitches on the next seam and then continue straight until you reach the next corner. I find if I can hold the layers together with my hands at this point and don’t need to pin. Just remember to go slowly so the edges stay properly aligned. Repeat until you’ve gone around all four sides; stop stitching about 10 inches from the beginning. 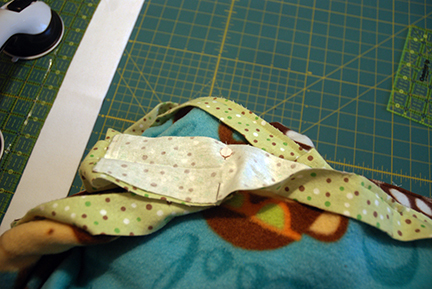 Fold the two pieces of binding on top of themselves, leaving a little bit of a gap. Then, open the folds of two pieces, and matching the lines from the iron, pin them right-sides together. I like to pin on the fold lines and remove it once I have the binding safely under the presser foot. Before you stitch this seam, just make sure to see that it will look fold correctly before you trim it. 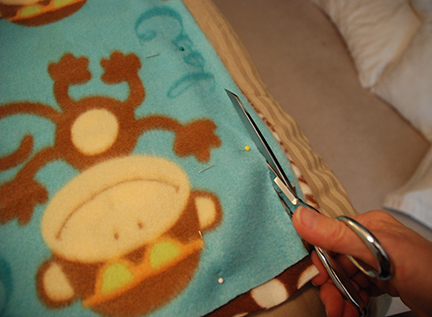 Then, trim it to 1/4-inch with your rotary cutter (careful not to cut the blanket) or with scissors. 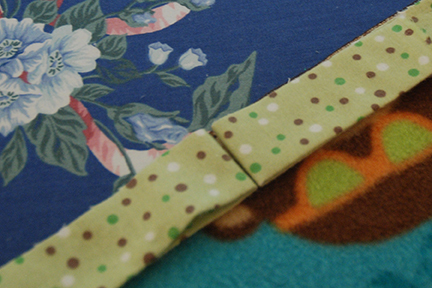 Now you can pin the unstitched portion of the binding and stitch it to the blanket. Clip the corners, making sure not to cut into the stitching. 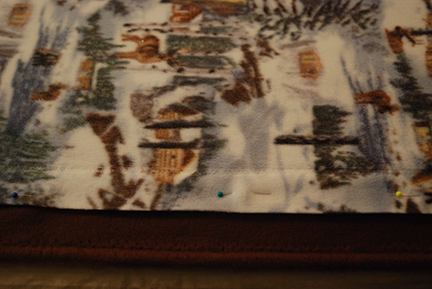 Next, I like to press the binding away from the blanket to help me when I pin it to the back. Just to be sure not to get the iron on the fleece, and use just a little pressure. To attach the binding to the back, you have a number of options. You could pin it and hand sew it, which I believe creates the best look, but it takes a long time and I don’t think it’s as secure as what the machine can do. Some people like to use wonder clips (It will take two boxes.). 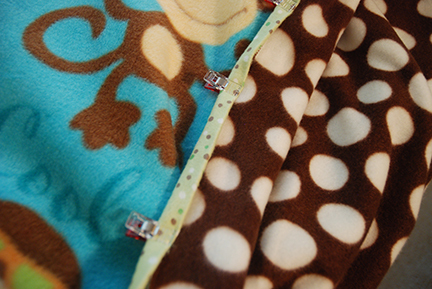 The advantage with clips is that they’re easy and you can see if your machine will catch the back when you pin them. 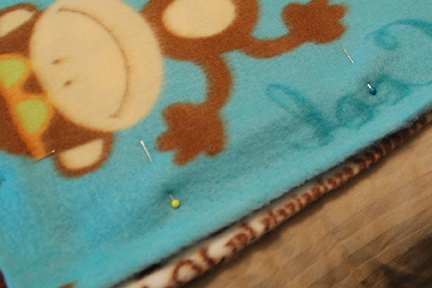 Since I didn’t have enough for the whole blanket, I used straight pins with a flat head. I pin them right in what’s called the ditch — right against the binding. That way I can see where it will catch on the back. Here I can adjust how much to leave for the machine to grab. I like it to be close, but not too much, since even with pinning, the fabric can slip. You’ll also want to pin this heavily. I find it worked best to place the next pin where the previous one ended. It’s time consuming, but worth it. When you get to a corner, you’ll see that folding the fabric over the front to the back creates and angled seam. When you pin the back, make sure that you fold one side over in the opposite direction from the way it looks on the front. In the photo above, the left side is over the right side. On the photo below, it’s just the opposite. To pin the corners, I found it worked best to put the pin in diagonally, catching both sides in the process. 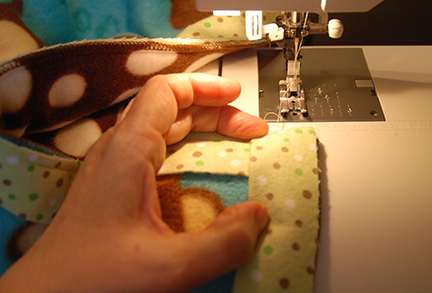 Once you’re all pinned, put the stitch-in-the ditch foot on your machine. I forgot to take a photo of this, but line up the metal ridge up against the binding. See that the needle will land in the ditch, the part closest to the stitching. You’ll want to land in there so your stitches don’t show. 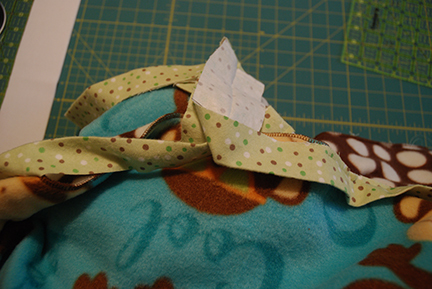 Alternatively, you could stitch the binding to the back and then stitch the top next to the edge. The down side is you’ll have a line of stitching all the way around the back, but if that doesn’t bother you, that’s a good way to make sure you stitching is even around the edge. I don’t find the minor imperfections a problem. Here’s a look at the three I made, in less than a day. As for cost, these aren’t the cheapest gift. I try to buy fabric when it’s on sale, but on average, one of these blankets will cost between $25-30. But I can tell you, they’re worth every penny. They wear like iron, and they keep you nice and toasty. If you’d prefer something a little lighter, you can use flannel for one of the sides. 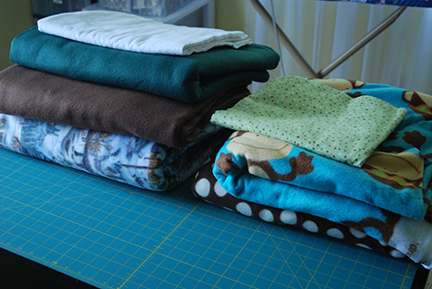 Since flannel is only 45-inches compared to 54-58 inches for fleece, I tend to use it for baby blankets so I don’t have to piece the flannel to make it wide enough. If you make one, I’d love to see it. If you have a blog, send me a link to the post at onemillionstitches@gmail.com, or you post the link or a photo on my Facebook page. I hope you’ve enjoyed my first tutorial. Here’s to a cuddly winter! Thanks so much for the kind words! I really love making these blankets – it’s an easy, afternoon project, and everyone loves them. Everyone I’ve made one for has told me their family fights over who gets to use it. Thanks, too, for the tip on telling which is the right side. 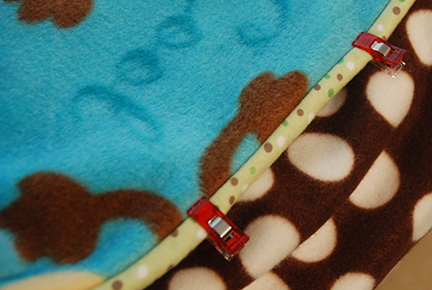 I’ll be sure to check out the link for additional sewing with fleece tips. 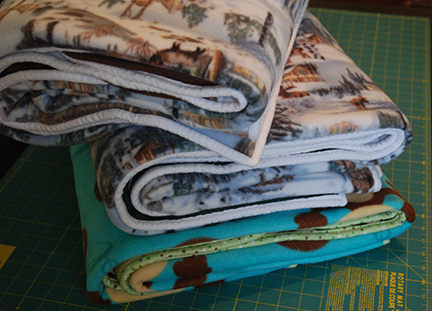 I love using the flannel for the binding of fleece blankets. 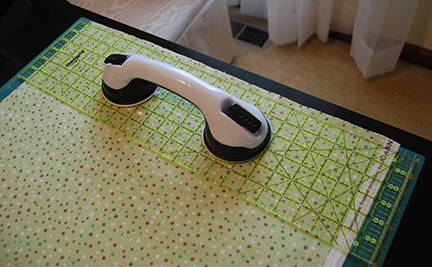 Have you thought to put your cutting mat under the project and slide it along as you go? That would protect your comforter. I hadn’t thought of that. Thanks for the tip! Nice tutorial! And the pictures help. Thanks. I’ve made about 20 of these, and I’ve yet to make one where the recipient’s family didn’t fight over them!